Two poplar specialists from AHB consortium partner GreenWood Resources explained the hybrid poplar breeding process and the logistics of planting and growing poplar on the 95-acre site. 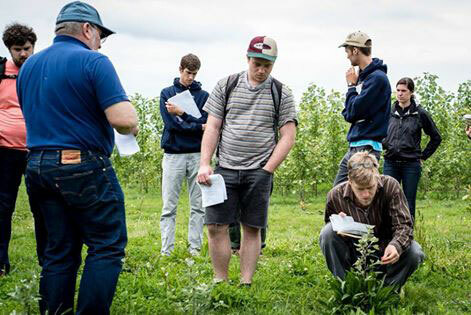 Students also learned about specific biomass trials being conducted and how biofuel and bioproduct industries may impact the future environmental equation. College students tour the AHB Pilchuck demonstration site. Senior Whitney Fleming thinks utilizing poplar is a good idea but has some concerns. “I think poplar (for bioenergy) is moving in the right direction but I’m not sure it’s at the point where it’s economical, sustainable, and feasible on a large scale,” said Fleming. While at the Pilchuck site students also heard about the best geographic areas to develop biofuel and biochemical industries. Upcoming field tours include June 30 in Hayden, Idaho; August 17 in Stanwood, Washington; and September 15 in Jefferson, Oregon.